Established in early 2002, Costa Rica Extreme, S.A. is an in-country, adventure excursion company whose primary emphasis is providing highly personalized, athletic and extremely exciting expeditions in our beautiful country. We offer our adventure clients a variety of unique experiences, not the least of which is the opportunity to participate in extreme sporting activities accompanied by world-class athletes as guides. Our company is innovative and our staff includes some of the best, most experienced and knowledgeable guides in Costa Rica. White-water rafting, camping, jungle excursions, mountain biking, canopy tours, sea kayaking, bungee jumping and horseback riding are just some of the many activities offered on our all-inclusive fixed date multi-sport excursions and our 1 to 3-day activity specific excursions. Upon your arrival in our vibrant country, you will be engaged in an assortment of the most invigorating experiences in Costa Rica. The accommodations on our excursions are among the best Costa Rica has to offer and are in keeping with the local ambiance. Uniquely ours is an exclusive, 85-acre private reserve on the Pacuare River where we’ve established a tropical tent camp, from which our adventurers can enjoy many of our extreme activities as well as the pristine, unspoiled beauty of the surrounding hills and valleys. In 2005, our CRE team once again represented Costa Rica at the International Rafting Federation’s World Rafting Championships in Ecuador. Captain Manuel and the team faced the best rafting teams in the world and finished a very respectable 14th, beating notable teams from Europe, Asia, Central and South America. In August 2003, our Costa Rica Extreme Team, the 2002 Costa Rican National White-water Champions, captained by our co-founder, Manuel Segura Amador, placed 10th in the world at the World Rafting Championships in the Czech Republic. Manuel was also a member of the 2000 National team and Captain of the 2001 National team. Under his direction and leadership the Team won the 2001 Latin American Championship, placed 5th overall at the 2001 Camel Whitewater GT in Zambia, Africa and placed 7th at the 2001 World Rafting Championships in West Virginia, USA. Manuel (or “Big Water” as he is known in the rafting community) has to his credit several first descents on some of Costa Rica’s most challenging rapids. Before establishing himself as a leading rafter, Manuel was an accomplished mountain biking athlete with several National titles under his belt. In addition to our rafting feats, in September 2002 another of our teams won the demanding Nicoya Adventure Race, beating fifteen other teams from all over Central and South America. This grueling overnight race consisted of sea kayaking, mountain biking, jungle navigation and hiking. Our team of expert guides includes several other members of the National Whitewater Team, a member of the Swiss Rodeo Kayaking Team and some of the most experienced and best naturalists in Costa Rica. We have led successful excursions on several continents including South America, Europe, North America and Africa. All of our excursion personnel are CPR and Swift Water Rescue certified. Our team of expert guides includes several other members of the National Whitewater Team, a member of the Costa Rican Rodeo Kayaking Team, and some of the most experienced naturalists in Costa Rica. We have led successful excursions on several continents including South America, Europe, North America and Africa. All of our excursion personnel are CPR and Swift Water Rescue certified. Costa Rica is on Central Time during winter months and on Mountain Time when the U.S. is in daylight savings time. 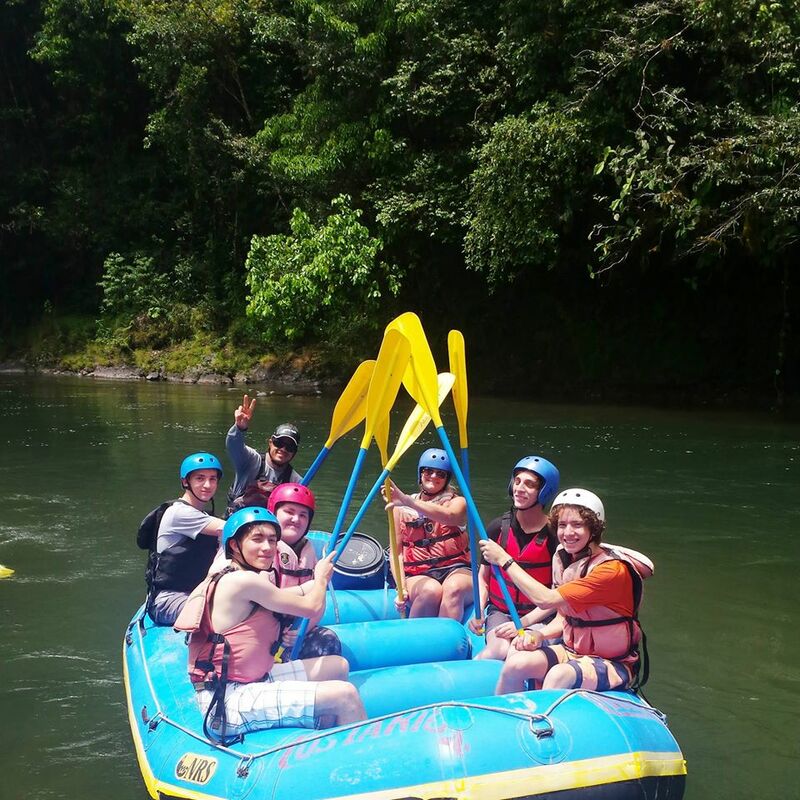 Don’t just take our word that “Costa Rica Extreme” excursions are the finest in the Costa Rican adventure travel industry, ask our past guests about their experience. Call or write about any of our itineraries and we’ll be happy to refer you to a guest who’s been there (and back) with us! "Your guides are terrific...everything on the trip is going fantastic." "This is the most adventure I've had in my entire life!" "We had such a great time in C.R.! Thanks sooooo much for everything!" The safety of our adventurers/clients is of paramount importance to us. While we cannot absolutely guarantee your safety during either your stay in Costa Rica or on our excursions, be assured that every reasonable precaution has been implemented to minimize your risks. Costa Rica is considered the most developed country in all of Central America. It has a stable Democratic government. Most importantly, its people have one of the highest literacy rates in the entire world at approximately 94%. As with any travel or adventure, you are in the best position to minimize your risk, common sense, and your own instincts are your best indicators of whether or not a situation is right for your level of skill, conditioning and your aptitude. If you are uncomfortable or uncertain discuss your concerns with your primary guide. He is a trained professional who is very familiar with all of the adventure activities you will partake in as well as the terrain and animals you may (or may not) encounter. Follow his instructions, be attentive, be prudent, be ready, and you will have a great trip! You’ll love vacationing in Costa Rica! Costa Rica is known for its beautiful beaches, delicious fruits, perfect weather, and breathtaking nature! Costa Rica enjoys the advantage of the perfect tropical climate. The average temperature is 72º in the highlands and in the 70’s to 90’s in the lowlands. There is a rainy season or “Green” season from May to November, and the dry summer season lasts from December through April. Even during the rainy season, the mornings are likely to be bright and sunny. It is common to have periods of rain during the dry season and dry periods during the rainy season. Costa Rica Extreme does not offer airline reservation, booking and ticket purchasing services. We do however have a network of expert travel professionals who can assist you in getting to Costa Rica. Call our office at (888) 877-2333 for a travel agent referral.